Scientists discovered what they’re calling a “white shark cafe” about 1,200 nautical miles east of Hawaii in the Pacific Ocean. They were exploring a patch of ocean that seemed desert-like, except that great white sharks were creating a lair there each winter after leaving food-abundant waters near the U.S. and Mexico. Scientists have yet to unveil a lot of the secrets these predators keep, which is why they keep exploring and studying them. A team of scientists from Stanford University and the Monterey Bay Aquarium in California conducted a study on the so-called white shark cafe. Their exploration lasted from April to May and helped them discover the secret area in the Pacific Ocean, which is roughly the size of Colorado. This area is full of “tiny light-sensitive creatures so tantalizing that the sharks cross the sea en masse to reach them,” according to the San Francisco Chronicle. 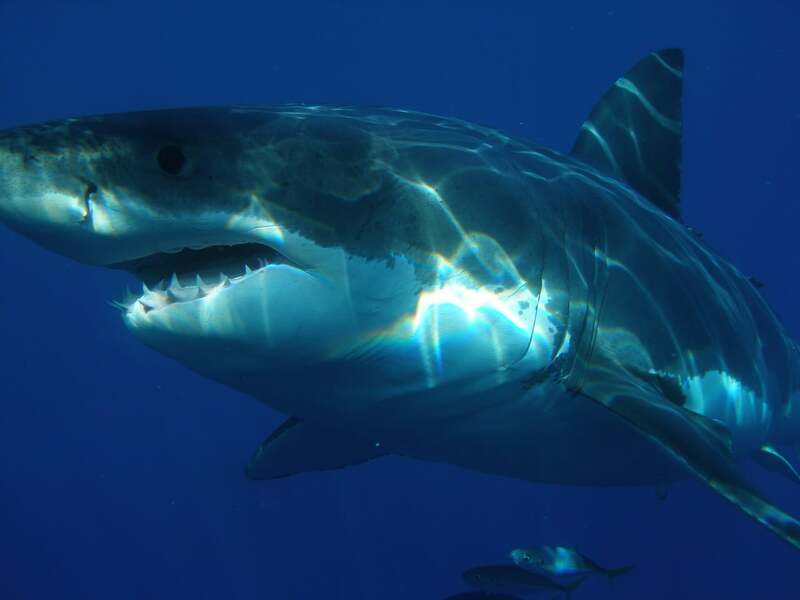 The waters likely attract the sharks because they are rich in squid, bigeye tuna, blue and mako sharks, and other fish. Stanford marine scientist Barbara Block is behind the discovery of the white shark cafe, which is currently the largest known gathering spot of white sharks. It took her 14 years to come to this discovery after attaching tracking tags to these sharks. As she collected data over the years, she discovered that the white sharks would travel to this spot in December, based on satellite data of the desert-like location. Thanks to the tracking tags, expedition members successfully located the sharks last spring. Aside from this discovery, scientists also found that these sharks show unusual diving behavior they still can’t comprehend. The team noticed the sharks’ odd schedule, as they would dive down 1,400 feet during the day, traveling to an area known as the mid-water, which is at the very edge of complete darkness in the ocean and surrounded by bioluminescent fish. In the nighttime, the sharks would ascend to shallower waters about 650 feet below the surface. Scientists initially thought the sharks went so deep into the darkness to hunt for larger fish, but they also discovered an odd behavior in only the male sharks. During April, the males travel in a V-shaped pattern up to 140 times per day. Scientists still aren’t sure whether this behavior is related to mating or perhaps hunting for a certain type of fish. Hopefully they will begin to understand these patterns after analyzing more collected data from the expedition.